Here is the racquet that Rafael Nadal tested for five weeks in the off-season – the HEAD MxG 3 (along with the HEAD MxG 5 ). I’ve been testing the racquets and here is my review. The HEAD MxG 3 is a powerful racquet as you can understand from the 74 RA stiffness rating. I can really only sum it up in two words: power and spin! So if this is what you’re looking for in your game, I would seriously consider this racquet. However, at the cost of power comes control and both MxG racquets are so powerful that they’re not for everyone. For you with shorter swings who would appreciate some help on your groundstrokes, I think the MxG line is an excellent choice, because despite the high stiffness rating, I didn’t sense any comfort issues. My test racquets were strung with HEAD Gravity hybrid string set – a really nice playing string I must say with great comfort (but more powerful than traditional poly’s). If you have long, technically sounds swings I would want to play-test the MxG 3 before committing to a purchase. The reason being that it is so powerful and requires you as a more advanced player to play with more “loop” in your swing. I also felt that the frame could benefit from some lead tape at 3 and 9 to boost the stability. I would also counter-balance this with more weight in the handle because the racquet feels really nice in your hand from the get-go so you’d want to maintain that balance. I also imagine some players would prefer an even more head light balance than the MxG 3, but I’m personally moving more towards 4-5 points HL. Unless you like really light racquets, 295 grams unstrung leaves some room for the above customization. What about the sweet spot? Well, it’s quite decent, but not huge. Especially since there are some instability issues when you hit outside the center of the racquet. The final verdict on the HEAD MxG 3? If you want a powerful, fast and easy-to-use racquet, the HEAD MxG 3 is for you. If you’re looking for a player’s racquet that will allow you to feel every shot – there are other racquets out there. You can order HEAD MxG racquets at Tennis Express or Pro Direct Tennis or check out HEAD MxG 3 or HEAD MxG 5 at Amazon. HEAD MxG 5 is the lighter model in the new racquet line from HEAD. The HEAD MxG 5 with its oversize frame and slightly extended length is not exactly my usual cup of racquet. However, from a veterans doubles player’s point of view I can see its allure. Despite its head size it’s manoeuvrable with its 275 grams unstrung, it has decent stability for that weight class and it has a massive sweet spot. Perfect for smacking a volley in your partners groin area. Its main features are the same as the MxG – power and spin a’plenty – but the sweet spot is obviously larger and with the extended length it offers good power despite the low weight. Again, the MxG line is not for the ATP Tour, but for recreational players looking for that extra power and spin to their game. You get a good-sized sweet-spot in a light and easy-to-use package and if you like some more weight and stability, try adding some lead tape. 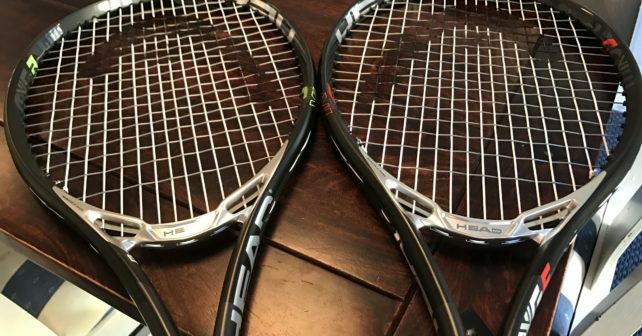 The HEAD MxG line of racquets are not for me personally as a player, but should find a happy following among juniors, veterans and intermediates. For the racquet category it’s in – it gets a thumbs up.